A cone with a base radius of 1 units and a height of 2 units has a volume of 2.094 cubed units. 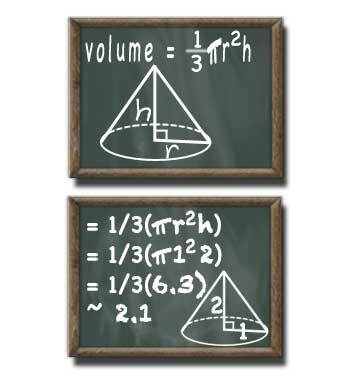 In plain english the volume of a cone can be calculated by taking one-third of the result of the radius squared, multiplied by the height, multiplied by the mathematical constant pi. Here is a step-by-step case that illustrates how to find to volume of a cone with a radius of 2 feet and a height of 3 feet. Note that in order to save space (and because pi cannot be determine precisely) a limited number of decimal places are used, the symbol ~ denotes that this answer is an approximation.